From 6th of March until the 8th of March the IT-Trans 2018 took place in Karlsruhe. The IT-TRANS consisted of a fair (organized by the local fair company KMK) and a conference (organized by the UITP). Larger and more international than ever before, IT-TRANS presented itself for the sixth time over three days. 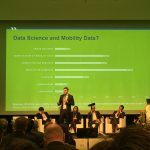 The growing significance of digital solutions for public transport is reflected in the visitor count: 6,000 international experts (2016: 5,000) came to Karlsruhe between 6 and 8 March to discuss the mobility of tomorrow. Karlsruhe Trade Fair Centre was a global meeting point for the sector, playing host to thought leaders from some 60 nations. 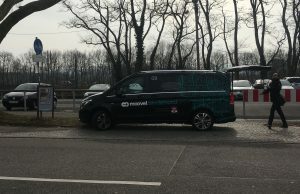 The first highlight was the arrival at the fairground: For participants was the pilot phase of the on-demand ridesharing service launched by the moovel Group and Karlsruhe Transport Network (KVV) during IT-TRANS. Visitors and local Karlsruhe residents ordered their journey via the “KVV.mobil” app, after which a van collected them at their location and brought them to one of 100 stops served within the city – without any rigidly defined timetable. Daniela Gerd Markotten, CEO of the moovel Group, said: “We are very grateful to the organizers of IT-TRANS for a very successful exhibition and for giving us the opportunity to present our moovel on-demand ridesharing service to their visitors. We are already looking forward to the next IT-TRANS in two years’ time.” The new mobility service is based on moovel’s on-demand platform, which uses intelligent “routing” and “pooling” to deploy a needs-oriented, flexible fleet with maximum efficiency. Routes are constantly calculated and updated, factoring in real-time data from traffic updates and the public transport network. LogiMobi tested the service several times. The app is easy to use and works seamlessly. A benefit I personally like is the possibility of following my vehicle after the booking until the arrival at the pick-up stop and during the ride. This makes it more transparent and I know if I have to rush to arrive on time at the pick-up stop. However, I realized that the service has sometimes difficulties and still some challenges to take: At the first evening I and a guest from the UK had the problem, that our moovel car did not arrive at the pick-up stop, but two other moovel vehicles. In the app, we were informed that our moovel car while pick us up at another stop (400m away in 1 minute). We missed this vehicle and had to rebook our trip. Nevertheless the comfort of this Ridesharing service with no change of trains from A to B is very good and will be huge success in the cities as well as in the countryside where it will be tested this year (amongst others: Stuttgart moovel, Hamburg MOIA, Berlin ViaVan) In this video Dr. Woehrl from moovel explains the concept. The first congress day started with the fair opening followed by the official congress opening in the afternoon. A total of 260 exhibitors (2016: 210 exhibitors) presented digital solutions for future public transport on an area measuring 15,000 square meters. The fair showed the wide range how Public Transport is linked to Information Technologies. Next to the proved businesses from the travel information or infotainment sector, companies from new sectors like software and multimodal traffic showed their products and services. The official opening started with a warm welcome by the mayor of Karlsruhe Dr. Frank Mentrup, the Minister of Transport of Baden-Würtemmberg Winfried Hermann and the UITP President Pere Calvet. Furthermore, Violeta Bulc, the European commissioner for Transport welcomed the public transport industry via a video message. She appreciates the focus of the fair to combine public transport with information technologies. In her speech, she emphasized that open, standardized and secure mobility solutions are needed to convince citizen to go with public transport and to make the industry more dynamic by itself. In the mayors‘ panel with Frank Mentrup, mayor of Karlsruhe, Gema Igual Ortiz, mayor of Santander, Spain and Roland Ries, Mayor of Strasbourg they showed their project in their cities like the special tram which can also drive on a national rail at Karlsruhe. 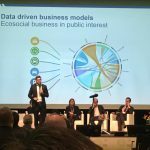 In the panel discussion of Drivers and Enablers of Digitalisation in Public Transport Oliver Wolff, general managing director VDV and Pierre Messulam, Vice President SNCF discussed with others about the impact of digitalization in public transport. 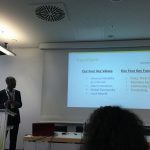 While all agreed on the drivers of digitalization like the smartphone, higher expectations by the customer and the possibility to use big data, there were some differences. Oliver Wolff prefers that the public-owned public transport companies cooperate which each other to retain the contact to the customer for example through a German-wide app. He is suspicious if companies want data from the public transport, because there is always business case behind, which will affect the PT companies. However, Pierre Messulam is fine with the customer contact in hands of international companies like Google as long as the service for the customer is good. He said the PT companies should sell their own data to this international companies because data is not needed by the public transport companies. As a compromise public-private partnership were discussed where both sides as its impact and will profit. Generally, the panelist agreed that technology helps to use the infrastructure more efficient and therefore reduce costs. Bernt Jenssen from Ruter, the public transport company in Oslo, emphasized that the digitalization should be used to make it easier for the customer to buy a ticket. the customer does not want to buy a ticket, but just to be sure that something is paid correctly to the authority. The first day ended with the IT-Family dinner at the ZKM in Karlsruhe with a rich dinner buffet and live band in a nice atmosphere. The conference programme was supplemented through market update forums held by exhibitors in the exhibition. One market update during the morning of the second day was titled with interoperability and scalability of MaaS. The goal of Mobility as a Service (MaaS) is to create a useful, seamless, easy platform and app for the end user to inform, decide and book a trip flexible and preferably on-demand. Three projects were shown. One problem all of the project leader have was to find a good software developer and programmer. They stated the getting the right employees is the main factor in the success of a project. Recruiting and retaining developers is getting more and more complicated. Developers are curious and easy bored with one project. Furthermore, they expect high salaries which are complicated to pay for a public funded project. During the session of open source and open systems, the CEO of Calypso presented their new open source ticketing product called keyple. It will be launched in 2018 and will be an open and secure contactless ticketing standard. Pieter Colpaert showed his project linkedconnections.org which use the open data of belgium public transport operators. Giles Bailey the CEO of the TravelSpirit Foundation explained their foundation values and functions as a policy think tank s. pictures. They work on studies which show the openness and MaaS maturity of cities and benchmark the cities. 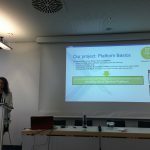 Annalisa Nuovo from ATM, the PT company in Milano, showed their integrated MaaS platform project. During the day there were free drinks and lunch for the congress participants. 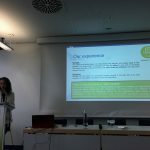 At the session of autonomous vehicle projects in public transport companies Natalie Rodriguez, Project Manager at Hamburger Hochbahn AG explained their project called HEAT. In the project, the HOCHBAHN cooperate with the industry like IAV or Siemens and research institute like the DLR. The project will focus on a newly build vehicle, the communication with the infrastructure and the control center. In the second half of 2018, the test operation will start without passengers in the vehicle. In 2019 passengers can vehicle will drive with passengers (see pictures). Bruno Schwager the director of the public transport company in Schaffhausen showed their project of the autonomous vehicle at the Rhinefalls (see above). The aim is to measure public acceptance of autonomous transport. In the last session of the second day, Thomas Friderich explained the seamless integration between transit and shared mobility of his company moovel. He showed the app how to book-on-demand ridesharing systems and public transport in one app. You can find more details about the moovel App in the first video in this blog entry. 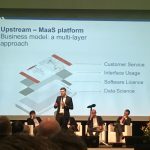 He was followed by Reinhard Birke, CEO of Upstream, a Vienna based startup, who explained the audience their approach of a MaaS platform. Every MaaS platform needs a customer service and a User Interface with easy access. They use furthermore data science tools to make a business model out of it. The monetization of mobility data is a key to make successful companies he thinks. Naturally, the data are anonymized and protected. 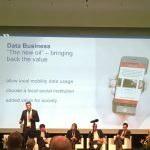 With its data, driven business models they could, for example, show the city of Vienna by which mode of transport the citizens go from one A to B. Upstream operates the local public transport App „Wien mobil“ and also will launch an App with its similar background systems for data science in Hamburg. Upstream was founded by the public entities of Wiener Linien and Wiener Stadtwerke and is therefore also a public company, while moovel is owned by Daimler. This was noted in the later discussion. Some public transport companies do not trust to give their data to the startups of OEMs/Car manufacturers. Thomas Friderich assuages the fear by making clear that moovel want wants to make agreements at eye-level. While booking.com has a market power and can dictate prices to the hotel, Moovel is depended on the public transport operator. Booking can delete some hotels on the result list, but if moovel would delete the public transport option with bus, tram, subway in a transit app no one will use it. This is the big difference while moovel needs to cooperate with the operators. On the third and last day, LogiMobi was not at the fair. A report about the MaaS session on the third day can be found at the Maas Alliance website. Overall the IT-TRANS 2018 showed that the digitalization has a big impact on the current public transport sector and the impact of it will grow. From ticketing or information techniques to new modes of transport with autonomous vehicles or Ridesharing which will need to new business models, the public transport sector is in movement. The companies are dynamic and eager to start projects or launch apps to enhance their service and be more efficient. 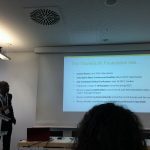 The next IT-TRANS will be held from 3 to 5 March 2020 at Karlsruhe Trade Fair Centre. For those who do not want to wait til 2020: In June 2019 the UITP will host their Global public transport summit in Stockholm.